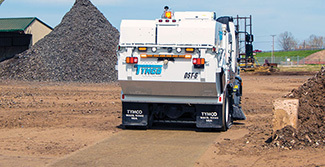 The TYMCO Model DST-6, the industry’s first full-sized dustless sweeper. 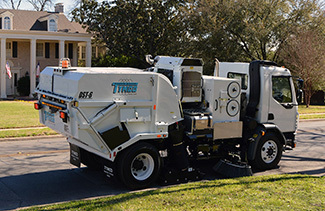 The DST-6 removes dirt, dust and debris from the sweeping surface, and uses filters that have a Minimum Efficiency Reporting Value (MERV) 16 Rating, meaning they are able to capture a minimum of 95% of 0.30 micron and larger size particles, far exceeding PM10 requirements. 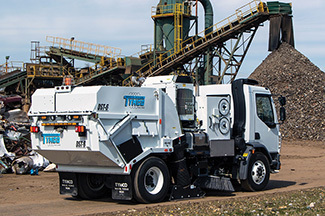 The TYMCO Model DST-6 pick-up head has a width of 87-inches and is equipped with a broom in the pick-up head for applications where a broom is desired. The fast rotation of the broom loosens packed-on debris and projects it into the Regenerative Air stream for effective cleaning. The 43” diameter Model DST-6 gutter brooms remove debris from curbs, gutters and around obstacles along city streets such as parked cars and maintenance equipment.